I met Billy on the corner of a small intersection about 100 yards from my school on one of my numerous dismal trawls around the city, trying to find a lift home from work. As I approached him, he seemed engrossed in a game of cards with a fellow driver and almost jumped into an oncoming bus when I addressed him over his shoulder (no doubt due to the fact that gambling is strictly illegal here). Anyway, after a very swift price negotiation, we were on our way to my apartment. It was during this journey that I first realised Billy could actually speak English, which came about after a rather hilarious incident involving two Vietnamese women. The two of them were wearing what can only be described as the outfit worn by Mercutio, at the Capulet party, in Baz Luhrmann’s adaptation of Romeo and Juliet. Not only this, but one of them was carrying an old school tape-player on the back of her bike which was blaring out music. Unsurprisingly, as they crossed the road together, they were totally unaware of Billy and I approaching and as a result nearly caused a collision. However, due to Billy’s nerves of steel and impeccable driving expertise, any incidents were avoided. But as we drove on past the pair, Billy said to me ‘man’, naturally I asked him to repeat and he responded, ‘2 man’ and pointed behind us. As l I turned around and saw the faces of the 2 women for the first time, it became very clear that they were actually 2 Vietnamese transvestites! After such an ice breaker, it was inevitable that Billy and I would form a strong bond; he now knows my work schedule inside out and is often a little worried if I break from the routine. He’s also got into the habit of mocking my tardiness after class. As he drops me off for work, he elicits what time I wish to be picked up, say 9pm, and rather than politely agree and be on his way, he’ll respond instead, ‘OK, 9.10pm’. Cheeky swine. Like all great friendships though, we have had a few altercations. The first was when he arrived to pick me up from work 15 minutes late, by which point it had started to rain and my hair had started to frizz. However, all was forgiven when, instead of apologising for being late, he apologised that it had started to rain – how very British of him. The second argument was actually of my own doing. He texted me one evening with the following: ‘what time I pick you up? I take you to my house.’ Naturally I assumed the ‘my’ was just bad English, but as he drove straight on past my apartment block later that night, I caused all hell of confusion by asking what he was doing. He quickly turned around and stopped outside my block and explained that his uncle had just returned from 2 years living in France and he wanted me to meet him. He then showed me the text and highlighted that he had indeed said ‘my house’. I know, I was a little creeped out by this situation too, but I’m pretty sure his intentions were all innocent. Nonetheless, I declined his very polite offer. In all seriousness, my life has been made so much easier having a chauffeur. I tried driving a motorbike when I first moved out here and immediately regretted the decision. And, while taxis are, comparatively cheap to the UK, there’s just something great about the fact that with a chauffeur, I can pay him 30p and he’ll get me home with no hassle or negotiation. Plus, what fun would I have in a taxi driving past 2 Vietnamese transvestites? I’d never have been able to identify them through tinted windows. XO Tours are a fantastic company who offer motorbike tours around HCMC. I’ve been exceptionally lucky to experience 2 of their tours, a delicious ‘Food Tour’ and a cultural ‘City Tour’ – both of which I would thoroughly recommend! Anyway, here is the link to their blog – it offers some great tips for anyone who is interested in backpacking to Vietnam. Shallow Pockets: Traveling Vietnam on a budget. It is hard to believe, but the moment you immerse yourself in the chaos, on a bike of your own, it does become a much less daunting place. Against all logic and reason, the flow of traffic just seems to work and you get from A to B much quicker than you would anywhere in the UK. This is, of course, under the proviso that you adopt one rule whilst driving; The ‘Obey the Hand’ Rule. 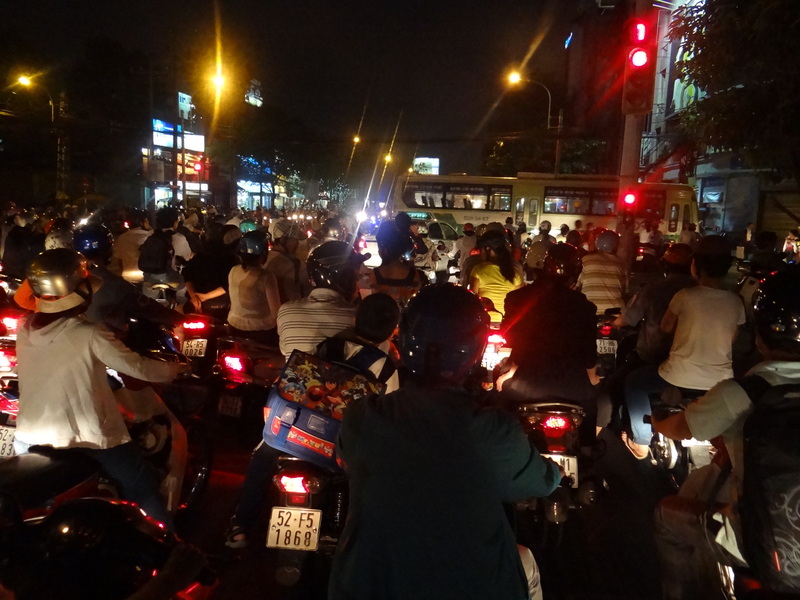 Indicators are null and void in HCMC; they are used but rarely acknowledged. Instead, the use of your hand as a flappy wing-type device tells those around you where you intend to go. This gives you such a great feeling of power, I mean, in what world does a hand have more power than a traffic light or indicator? Incredible. There is a new generation of young adults that’s emerging in Vietnam, heavily influenced by both Hollywood and the Korean pop scene. As a result there are millions of twenty-something men walking around the city like they are part of a 90s boy band. And for me, this is quite possibly heaven on earth. I am constantly surrounded by Asian versions of 90s Justin Timberlakes and Nick Carters. Truly living the dream. You know you’re jealous really. The food out here is great, I mean it really is. It’s cheap, it’s tasty and it’s pretty damn healthy. Until, that is, you get served a dodgy prawn at a market that ties you to a toilet for 16 DAYS SOLID. Or, you walk past a rotisserie with a roasted dog skewered on it. Not to mention the constant stench of vomit that is diffused by the ‘delicious’ Durian fruit. All that aside, I have been introduced to some Vietnamese delights. Cơm tấm has rapidly become my new favourite lunch, a simple concoction of a pork chop, rice and a sweet chilli sauce (I have to tell myself it’s sweet chilli because if I acknowledge the truth that it’s actually ‘Fish Sauce’, I’d never eat it again). I’ve also been introduced to some fruit and vegetables that have literally changed my life forever; Star Fruit (a fantastic cocktail addition), Okra (BBQ’d is just divine) and Zucchini Flower (boiled with just a dash of salt, could happily eat it on toast to be honest). It really is a strange place for food – I still can’t get my head around to eating noodle soup for breakfast or even eating the head AND shell of a prawn, but I guess it’s all part of the fun! 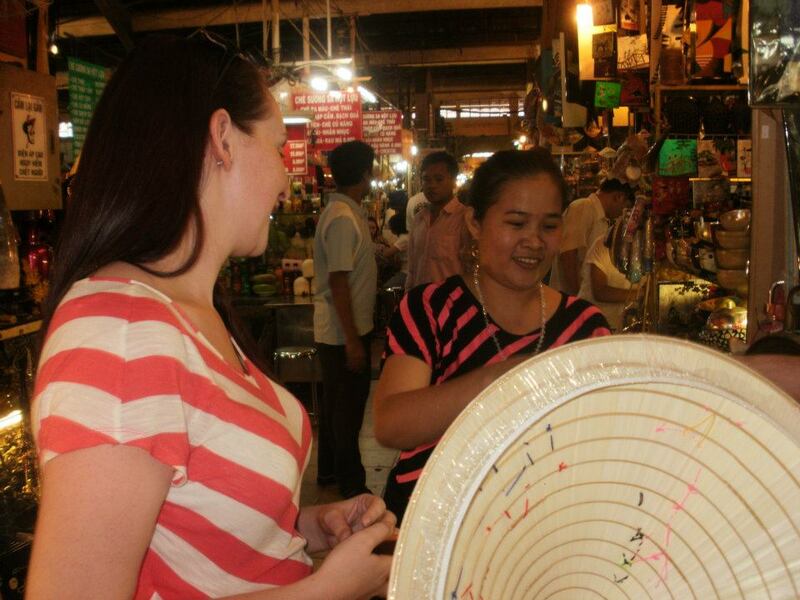 Shopping in Vietnam is ruled by bartering. In the first few months of living here, I hated it. I really despised walking into a shop or market and having people pounce on me, pushing and pulling me around like I was a piece of meat. This really quite depressed me because I love a good ol’ shop (the teenage puppy-fat ridden me hated the notion, but I like to think I’ve matured since). Although now, after learning a few stock Vietnamese phrases, shopping has actually become quite banterful. Shouting ‘mắc quá’ (too expensive) at them blows their mind and the minute you are established as an expat (still don’t really like that somewhat pretentious label) and not a tourist, they actually show a bit of an interest in your life (whilst staring unwaveringly at your chest, naturally). So a quote from a dead politician is probably a bit of a pretentious start to my first ever blog, and even perhaps a little misleading by the fact that I know very little of the political world. However, I’d like to think it highlights the approachability of my writing – here’s to hoping anyway! For the Lord of the Rings fanatics who got uncontrollably excited at the mention of Hobbits in my tag line, I’m afraid you’ll be sorely disappointed by, yet another, misleading piece of info. While I thoroughly enjoyed the first ‘Hobbit’ movie instalment earlier this year, I have no interest whatsoever in the Lord of the Rings films – unless you consider an unhealthy obsession for Orlando Bloom a qualifying trait? I actually acquired the nickname of ‘Hobbit’, as a naïve and unassuming 5ft 14-year-old waitress. It was coined by my first ever crush, a 21-year-old barman (setting my sights high from an early age!) I thought it was a cute little pet name that we could share for the rest of our married lives together; until I later discovered that the tag came after he noticed my unusually hairy big toe one summer’s day – I promptly handed in my letter of resignation to the restaurant. Needless to say, wearing flip-flops, and any exposed-toe sandals for that matter, is still quite painful. This has been proven particularly testing living in the tropical climes of Ho Chi Minh City though. And when I say ‘living’, I think ‘surviving’ is probably more apt. And this is where my blog title ‘Cô Kerri’ comes from. Hoping not to sound too patronizing, a quick Google translate will tell you that ‘Cô’ means Aunt – this is wrong (take that Google!). Cô actually refers to any female above the age of 18 and is better translated as ‘Miss’. This is a title that many of my younger students address me with, which was quite endearing at first. But after 77 Saturdays of 5 year olds screaming ‘Cô Kerri’ like their lives depend on it, the novelty has worn off a little. Vietnamese coffee – it really does live up to the hype. The accidental murder of Gary the Gecko, our very first Vietnamese pet. Cultural journeys: Singapore, Dubai, Cambodia, Thailand & Vietnam (visiting a wonder of the world, Ha Long Bay, twice was really quite wondrous). An unprovoked punch to the arm by a Vietnamese pedestrian man in Hanoi. Taking a sip of 7Up from a glass swarmed with ants (no, I didn’t realise they were there until after I’d swallowed). ‘Monday Madness’ – being presented with a 50% discount on bloods after being taken to hospital with suspected gall bladder infection (how kind of them!). Being told that I must be with child, by a 6-year-old Vietnamese boy and in English none-the-less (I didn’t know whether to commend his pronunciation or send him to the naughty corner). Everything in Vietnam is, quite literally £1. Fancy a meal? £1. A trip on a cyclo? £1. Need to fill up on petrol? £1. Want a new (fake) Zara jumper? £1. Seriously. Now many of you may be wondering why I’ve only started this blog 18 months into my Vietnamese hobbit adventure. At the risk of portraying myself like an old woman who enjoys stroking her multiple cats and knitting never-ending scarves in a rocking chair, I’ve actually been putting together a traveller’s scrap book of my experiences for the last year. You may call me old-fashioned, but really, you should see it, it’s beautiful. Anyway, I’ve now run out of free pages in my beloved work of art and so thought, why not kill 2 birds with one stone and entertain others whilst also documenting my life. I know, I’m so selfless thinking of others in such a way. So, here’s hoping it’s the start of something beautiful … Một, Hai, Ba Dzô!